Good morning! Can you believe we are already half way through the week? 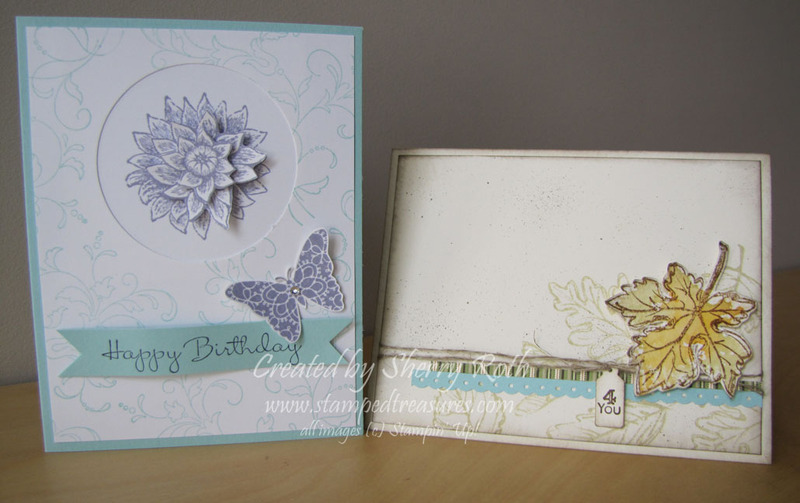 Today I am sharing with you two of the 4 cards that we will be making at my monthly card class on Friday September 30th. The other two cards will be Christmas cards - I know it seems early but you can never start planning early enough for Christmas! Class fee is only $20 and includes all your precut cardstock and envelopes. Please bring adhesive and scissors. Beginner and experienced stampers are welcome. Choice of class times - 9:30 am or 7:00pm on Friday Sept. 30th. Payment and registration due by September 27th. Please use the Paypal link below or contact me to register. Hope to see you on September 30th!